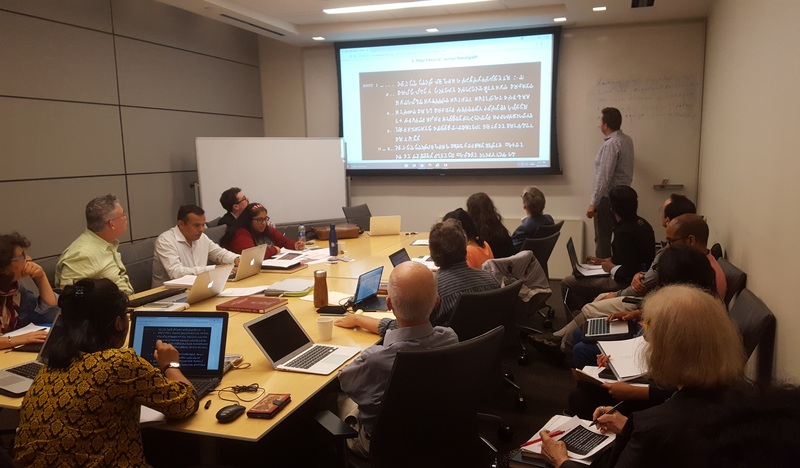 The University of Pennsylvania, with the generous support of the the Committee of Ancient Studies, the South Asia Center and the Department of South Asia Studies, held a week long international workshop on early Indian epigraphy focusing on the development of the early Brāhmī script, in which much of the earliest forms of writing in the ancient languages of Sanskrit and Prakrit occurred. The workshop was held at the Kislak Center for Special Collections, Rare Books and Manuscripts in Van Pelt Library between Aug. 20-24, 2018. The workshop was a great success, with over twenty participants (including both students and faculty) from a variety of universities across the United States and Canada. The workshop was organized by Professor Daud Ali (Penn) and Professor Luther Obrock (Toronto) and special guest Professor Jason Neelis (Wilfred Laurier University, Canada), a world-renowned expert in early Indian epigraphy in Brāhmī and Kharoshti scripts. The workshop began with representative readings of the very earliest inscriptions found in the Indian subcontinent, the corpus of Aśokan edicts and cave inscriptions of the third century BCE, and was followed by first-century BCE label-inscriptions from the stūpas of Bharhut and Kanagahalli, first and second-century CE cave inscriptions from Sri Lanka and the many sites of the Western Ghats, and concluded with a range of diversely dated donative and graffiti inscriptions from the lower capital of the Kushan empire, Mathura, and sites along the Indus river in contemporary Pakistan dating to the first centuries CE. The workshop included two reading sessions a day (morning and evening) as well as a brief lecture and discussion on a thematic or historical topic relating to the use and interpretation of inscriptions. The goal was to provide familiarity with the Brahmi script (including its regional variants) from its inception down to the 3rd century CE. Participants also received a brief and basic overview of the grammar and morphological features of the languages of the inscriptions, from early Magadhi down to ‘epigraphical hybrid Sanskrit’. Participants came away with the ability to read and understand early Indian epigraphy and how this material is used in historical, linguistic and art-historical research. There were also visits to the Philadelphia Museum of Art and a special viewing of Penn's numerous Sanskrit and Indic manuscripts in Penn's Special Collections. This workshop, the first of its kind to be held in the United States, signals a growing interest in epigraphy in the fields of Indology and Sanskrit studies and is intended to be an ongoing project with the goal of developing a full curriculum facilitating the acquisition of Indian epigraphic and (eventually) chirographic scripts that can be integrated into the existing teaching programs in ancient Indian languages like Sanskrit, Prakrit and Pali. Feedback on the conference has been extremely positive and the workshop organizers are greatly encouraged to take this project forward.